I stood in my kitchen thinly slicing a bunch of radishes feeling slightly awestruck by their beauty. The hot pink skins and unblemished, creamy white interior. The way they sliced so thinly with little effort on my part. A pile of them collecting on my cutting board looking like little pieces of pretty paper. Like Chinese cherry lanterns. It’s thoughts like that and my mesmerization with the beauty of food that make me realize my relationship with food is a little off. But if you’re reading this blog, you’re probably in the same boat. My cooking with pink radishes has been remarkably un-inspired until now. I’ve only either halved them and sprinkled with salt, pepper and chat masala as an Indian appetizer salad. Or I serve them whole with good butter and kosher salt. Both delicious ways to eat radishes but kind of boring. 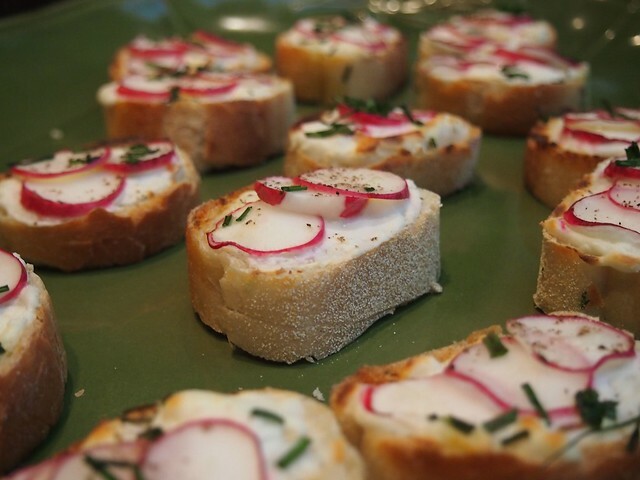 Then I saw this recipe for radish crostini from Erin at Fresh365. You can find the recipe on Fresh365 but its basically rounds of bread topped with cream cheese, thinly sliced radishes, a sprinkle of chives, salt and pepper and a drizzle of olive oil. 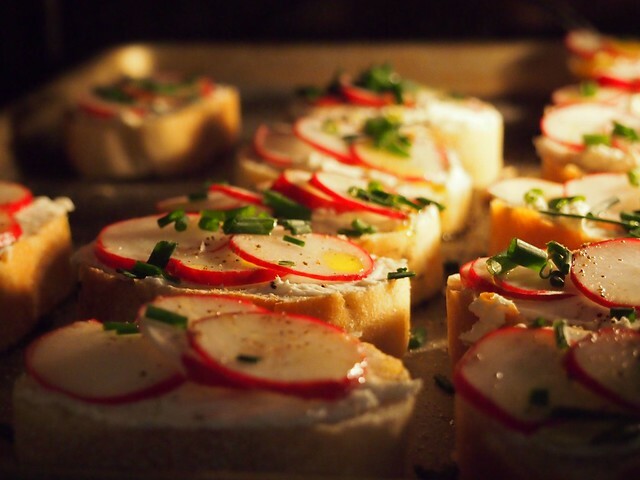 After 2-3 minutes under the broiler, the cream cheese gets toasty and warm but the radishes remain crisp and spicy. And they are beautiful!